Since the industrial revolution, the increasing levels of carbon dioxide (CO2) in the atmosphere has been a direct consequence of the human activity. CO2 is the main cause of climate change, directly connected to many destructive phenomena, such as hurricanes, flooding, and wildfires. Reducing CO2 levels is the basis for some of the most important international agreements, such as the Paris climate agreement of 2015. Thus, it is a hot topic in many research fields, from biology to physics. 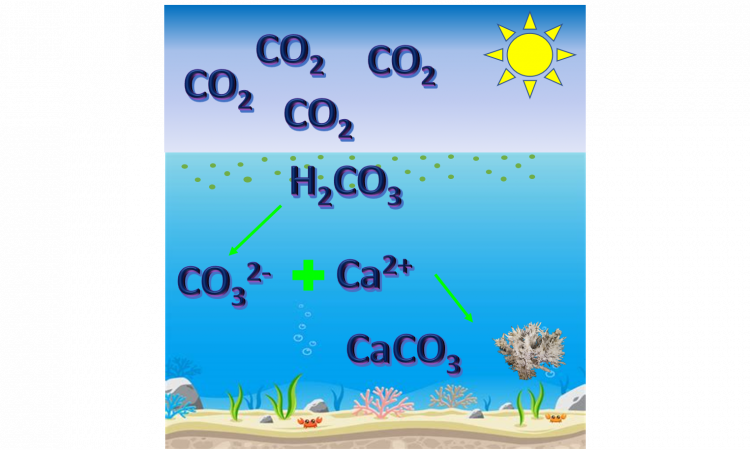 The authors of this paper show us how the sea itself could capture CO2. They suggest enhancing a natural process, chemical weathering, to increase the amount of CO2 that the marine water can store. Chemical weathering is the way our planet deals with CO2 on long timescales: chemically disintegrated naturally-occurring rocks help convert atmospheric CO2 into harmless solids. where H2CO3 is called carbonic acid. In a high-pH (or basic) environment, bicarbonate and carbonate (HCO3– and CO32-, eq. 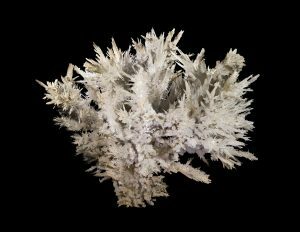 2 and 3) form and, in the presence of calcium or magnesium cations (naturally existing in seawater), precipitate as a mineral when the solution is saturated (eq. 4). These reactions happen at equilibrium: as long as certain conditions, such as temperature and pressure, are unchanged, the ratio between the amount of reactants and products is constant. Thus, the precipitation of solid CaCO3 removes it from seawater, and equilibrium causes the reaction to “shift to the right” – basically, more reactants are needed. As a consequence, more gaseous CO2 is used in the reaction, and removed from the atmosphere. This study focuses on some silicate minerals, rich in magnesium and iron (dunite, harzburgite, and olivine basalt, Figure 1), that have been shown to cause mineralization of CO2 in seawater. In this experiment, the selected rocks were ground with a ball mill to different degrees and were observed in artificial seawater in open system reactors. These reactors were constantly shaken to mime ocean waves and to reproduce the coastal environment. Each experiment lasted two months. Metal concentrations, pH, and dissolved inorganic carbon (DIC) were monitored over time, as well as the composition of the rock materials. The type of rock and the amount of milling was shown to influence the sequestration of CO2: the most milled dunite and harzburgite showed the best results (basalt is too resistant to the mechanical stress of the ball mill). They caused a fast precipitation of CaCO3 (in form of aragonite, Figure 2) within the first hours of the experiment. Moreover, at the beginning of the experiment, the pH increased while the DIC and Ca2+ concentrations decreased: when the experiment starts, the increase of pH, due to the dissolution of Mg-silicate materials, leads to the formation of CO32- (eq. 2 and 3) that is easily sequestrated by Ca2+(eq. 4). The presence of Mg2+ from the milled rocks then enhances CaCO3 formation from the solution. The authors of this paper show that the milling of these rocks can enhance the CO2 sequestration potential of marine environments. This idea must be further developed to optimize the method, keeping in mind that the milling of the rocks can generate CO2 as well. Thus, it is necessary to balance that out when an estimation of the amount of sequestrated CO2 is made. It is also important to consider the effect that a great abundance of these materials could have on the marine ecosystem.